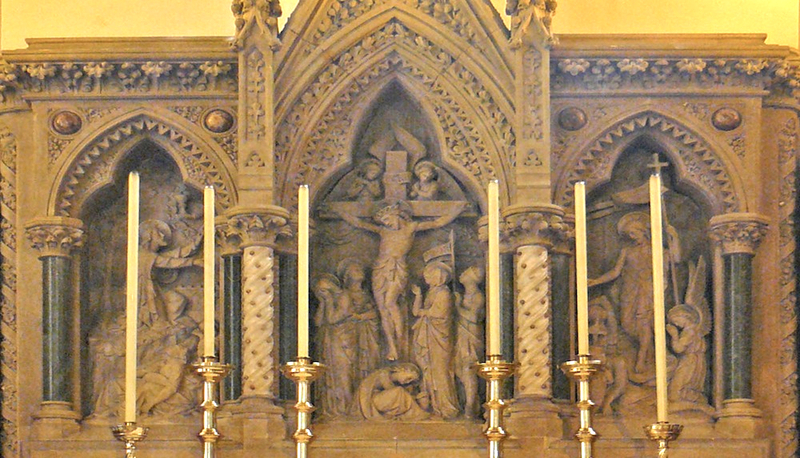 Reredos with high relief showing events before and after the crucifixion, around Calvary itself. Thomas Earp, 1869 (listing text), Caen stone. This is in the sanctuary of Inverness Cathedral. John Gifford describes it as "[c]ontemporary" and "lumpy" (188), yet it is very much a Gothic Revival piece, with a high, pointed, crocketed gable. Only the central columns are unusual, with a spiral finish studded with (probably) semi-precious stones. Close-up of the altar front. The Caen stone altar itself, of the same date, is also elaborate, with its panels presenting the Lamb of God on the left and the Pelican feeding its young on the right, with an embellished cross in the middle. The altar and the reredos match well in style and materials. 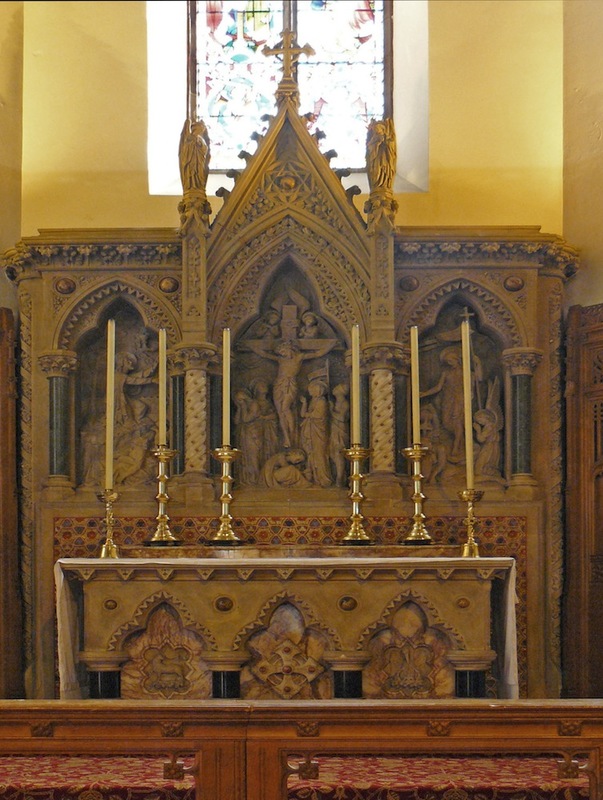 Both may have been designed by Ross (who is known to have designed the corbels, pulpit, sedilia, etc) and executed by Earp, but only the reredos is given as carved by him. John Gifford's problem with the carving may be a lack of definition, either because of the materials or the lighting here. The reredos in its setting. "Inverness, Ardross Street, Cathedral Church of St Andrew." British Listed Buildings. Web. 18 December 2017.